Touchscreens are okay, but controllers are better. What’s better than a controller? A quality retro one like the SNES30. Playing with this controller is straight nostalgia – only improved. For a limited time, Kotaku readers can grab one for just $29.95 - nearly 15% off retail price (with free shipping, of course). Finally, you can connect with your favorite console or computer to play any modern or old school game with arguably the greatest controller of all time. 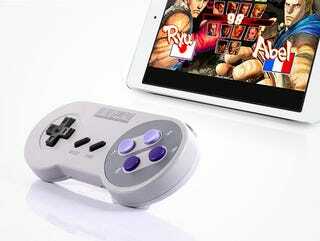 This throwback gamepad is a perfect 1:1 replica of the original SNES controller, and is compatible with nearly any Bluetooth or USB capable device. It’s slim enough to fit in your back pocket, and lasts for 20 hours on a single charge so you can easily take it with you for on-the-go gaming. For just $29.95, you’ll get the SNES30 gamepad, an SNES style USB cable, and an SNES 30th Anniversary keychain for good measure. To make things even sweeter, shipping is included to the continental US. These are sure to sell out fast, so grab yours at the link below today.